M Krishnan. How To Do A Procedure: Bioptome-Assisted Simultaneous Delivery of Multiple Coils for Occlusion of Large Patent Ductus Arteriosus. The Internet Journal of Cardiology. 2001 Volume 1 Number 2. Trans-catheter occlusion of moderate to large (> 3mm) patent ductus arteriosus (PDA) is usually achieved using expensive devices. Closure of such ducti can also be attempted using detachable coils or direct delivery of free Guianturco coils which delivers single coil. 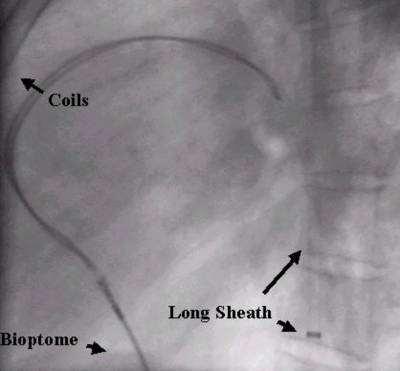 This may entail multiple deployments of further coils, prolonging the procedure and fluoroscopic exposure. 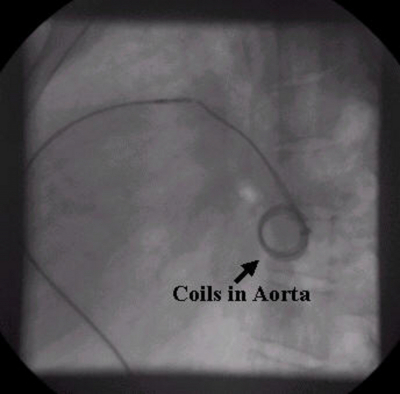 Moreover, delivery of free coils runs the risk of coil embolization into the pulmonary artery or aortic branches necessitating cumbersome retrieval procedure. Bioptome-assisted simultaneous delivery of multiple coils permits safe closure of moderate to large ducti usually in a single deployment. The advantages of this method are optimal compaction of the coil mass in the ampulla of the duct with high probability of closure of the duct in single deployment, short procedure time and fluoroscopic exposure and virtual freedom from coil embolization. Measurement of minimum duct diameter should be undertaken with 2D echocardiography and aortic angiography. A pigtail catheter is placed against the duct and angiography done. The minimum duct diameter is measured by frame-by-frame analysis. This is important as the duct size varies with phases of cardiac cycle. 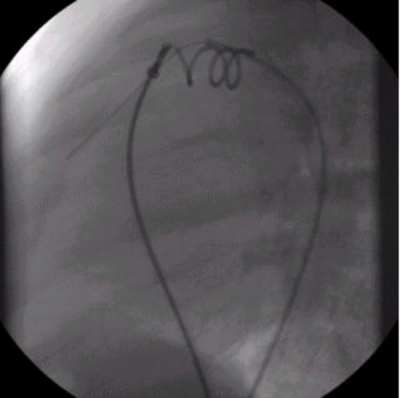 An MPA catheter may be placed across the duct before angiography so that the duct diameter may be compared with the diameter of the catheter lying across the duct. In addition to the measured diameter, the extent of dye spillage into the pulmonary artery also should be assessed. The size of the ampulla should also be assessed .This can be readily done with echocardiography in from the suprasternal view. At least one coil should be of 0.052” and further coils may be either0.052 or 0.038”. One coil loop diameter should be twice the minimum duct diameter. Other coils may be of the same diameter or smaller. Different loop diameters has the advantage that the smaller loop will coil inside the larger one resulting better compaction of the coil mass and may facilitate greater chance of closure. The length of the coils should be such that about 2 to 2 1/2 loops lie in the ampulla. The long sheath size should be selected such that the coil assembly moves in the sheath effortlessly without resistance. For 2 coils of 0.052” a 6F sheath will suffice. For more coils of varying sizes, larger sheaths will be required. The loading sheath should be one French size less than the long sheath. The coils are extruded from the metal tube slightly at the end having the ball. The end of one coil is stretched slightly using a hemostat. Using a proline or silk suture material, the ends of the coils are tied together so that the ball of the stretched coil end sticks a little farther than the other coils. The loader is threaded on to the bioptome. 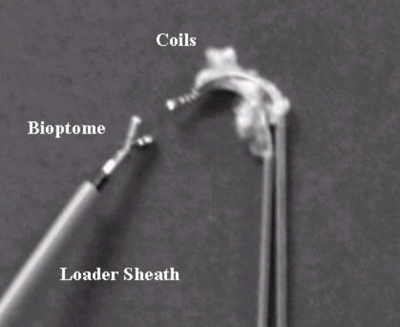 The ball of the coil is caught between the jaws of the bioptome and the coils are then withdrawn from the metal tube into the loader. The grip of the jaws on to the coil is checked by pulling at the bioptome firmly. 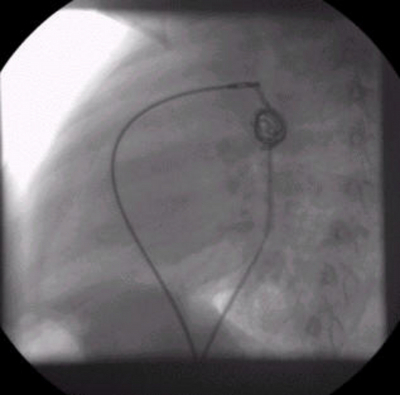 A stiff Amplatz exchange length wire is placed deep in the descending aorta through the multipurpose catheter. 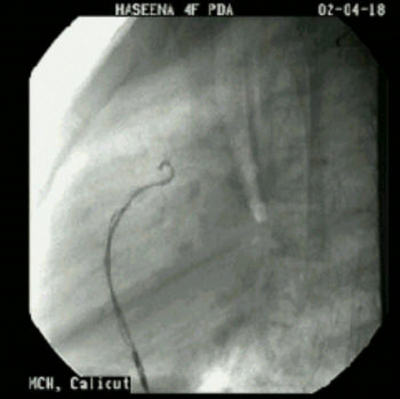 The catheter is taken out and the long sheath is passed over the wire so that its tip lies in the descending aorta about 2” beyond the duct ampulla. A check angiogram is done after 5 minutes. If the occlusion is complete, the jaws of the bioptome are opened thus releasing the coils and completing the deployment. If there is difficulty in releasing the coils gentle torque on the bioptome without applying traction will do. The duct closure will usually be achieved in 5 minutes. If in the unlikely event of the check angiogram showing significant residual flow after 10 minutes further coil deployment of 5cm* 5mm coils should be done from the arterial approach. 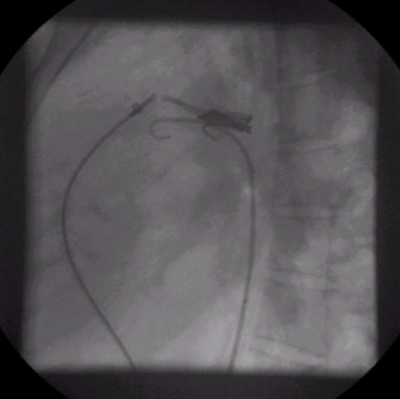 The bioptome is left holding the coils; the duct is crossed from the arterial route using a glide (Terumo) wire. A 5 F MPA taper-tip catheter is introduced into the PA over the wire and the wire is removed. The coil is pushed along the catheter using a 0.038” guide wire and the deployment is completed. More coils if needed can be deployed in this manner (Figure 7). The coils held by the bioptome are released once the flows are completely eliminated. The procedure is virtually free of complications. With proper selection of coil combinations complete closure of the duct can be achieved in most cases with single deployment. 1. Grifka RG, Jones TK. Transcatheter Closure of large PDA using 0.052 inch Guianturco Coils: Controlled delivery using a bioptome catheter through a 4 French sheath. Cathet. Cardiovasc. Intervent 2000; 49:301-306.